Honeyville's Powdered Butter may be used as a one-to-one replacement in all butter applications including bakery goods, breads, cookies, cakes, muffins, sauces, and toppings. Our dried butter powder requires no refrigeration and is ideal for camping, travel, and long-term food storage. This product may be stored for up to 12 months opened, and 3 to 5 years in airtight sealed cans. Once the powdered butter is rehydrated it should be refrigerated and used within 4 days. Add 4 level TBSP powdered butter to 1 tsp warm water to replace 4 tablespoons of fresh butter. Mix well. The texture and flavor can change with more or less water. For larger batches, add 9 parts powdered butter to 1 part water. Enjoy! 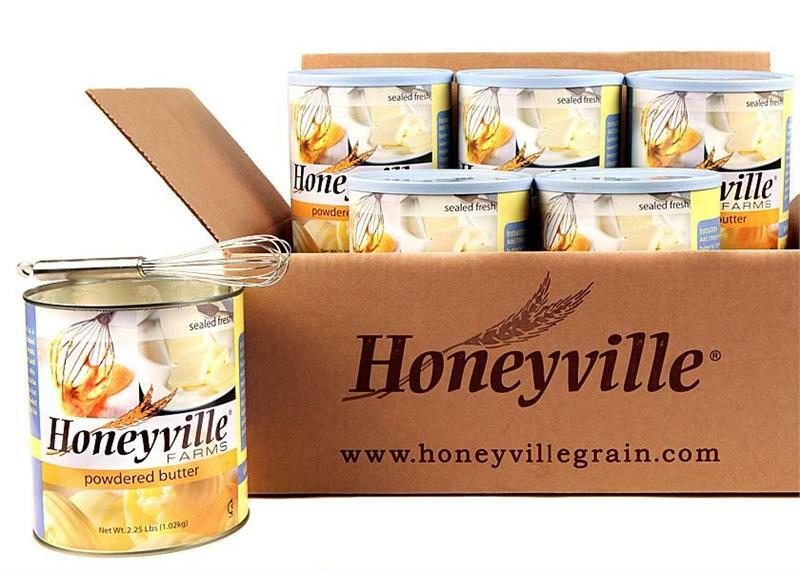 Honeyville Powdered Butter can be used in a variety of applications including: baked goods, breads, cookies, cakes, muffins, sauces, toppings and more. Butter (cream, water, salt), Nonfat Milk, Tocopherols, Ascorbyl Palmitate and BHT (added to protect flavor). Honeyville's Powdered Butter can be stored 3 to 5 years sealed and unopened, and up to 12 months opened. As always storage life is dependant on storage conditions. Always store food products in a cool, dry place for optimum storage life. Each # 10 Can of Dried Butter contains 2.25 pounds of product. A #10 can measures 7 inches tall and is a little over 6 inches in diameter, or roughly the size of a large coffee can.